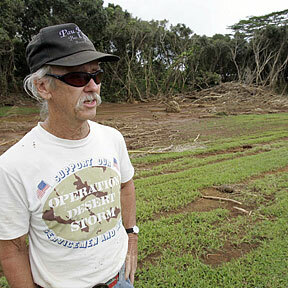 KAUAI DAM VICTIMS UNITE: John Hawthorne is a resident living along Wailapa Stream. Behind him is the washed-out area of the stream at the bottom of his property. The grooves and ruts in the grass behind him were caused by uprooted trees dragged over the area by the floodwaters of the dam failure. His property is about 200 yards downstream of Kuhio Highway. They are accused of warning a North Shore operation of impending HPD raids. State and federal officials say the city never asked approval. Call him assured, cocky or brash, Kanye West not only talks the talk, he produces hits. The UH hitter has double-figure kills in all but six of 23 matches. The interisland shipper is preparing for more growth on the neighbor islands. Texas Rep. Tom Delay, the one-time powerful majority leader, has announced he will quit the U.S. Congress. The Navy will void its contract with a private company managing a tented concession area near the USS Arizona Memorial.